"Sampath Speaking" - the thoughts of an Insurer from Thiruvallikkeni: genocide in Nagorno-Karabakh ~ President daughter indulges in selfie !! genocide in Nagorno-Karabakh ~ President daughter indulges in selfie !! People of behave strange ! ~ Taking ‘selfies’ is a mania !! ~ when people spot celebrities – they whip out their camera, head strikes a posture, hands extend as they click a selfie with the famous; this gets repeated - also when they are famous places .. .. .. but what would those so called celebrities do ?? ever imagined ??? When Danish Prime minister Helle Thorning-Schmidt took a "selfie" on her smartphone, like millions of people do every day, she doubtless had little idea of the commotion that would ensue. It created ripples for the photograph was taken at the memorial service for Nelson Mandela; What's more, Thorning-Schmidt was flanked in the shot by a smiling Barack Obama on one side and David Cameron squeezing in on the other. And all three looked as if they were ready to Snapchat their larking pose to all their schoolfriends ! Ilham Aliyev is the fourth and current President of Azerbaijan, in office since 2003. He also functions as the Chairman of the New Azerbaijan Party and the head of the National Olympic Committee. He made people talk more earlier this year, when he appointed his wife as first vice president, the move seen as tightening the family's grip on the oil-rich Caspian nation. 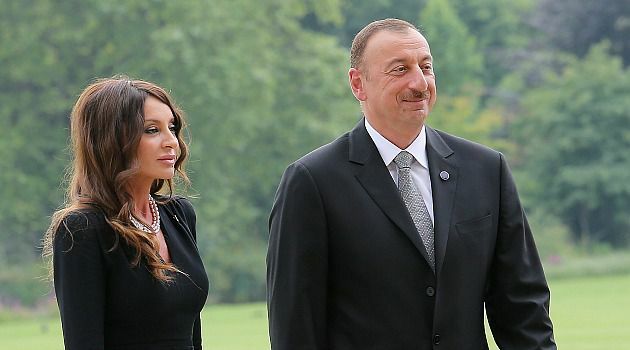 That appointment of Mehriban Aliyeva followed constitutional changes made after a tightly managed referendum last year which introduced the powerful position of first vice president, the second most senior official in the country. Aliyeva, 52, is no stranger and has been an MP for the ruling Yeni Azerbaijan party since 2005 and head of the influential Heydar Aliyev Foundation - named after her father-in-law and former president. Azerbaijan is a country in the South Caucasus region, situated at the crossroads of Southwest Asia and Southeastern Europe, bound by the Caspian Sea, Russia, Georgia, Armenia and Iran. The Azerbaijan Democratic Republic proclaimed its independence in 1918 and became the first democratic state in the Muslim-oriented world. The country was incorporated into the Soviet Union in 1920 as the Azerbaijan Soviet Socialist Republic. The modern Republic of Azerbaijan proclaimed its independence on 30 August 1991, prior to the official dissolution of the USSR in December 1991. In September 1991, the Armenian majority of the disputed Nagorno-Karabakh region seceded to form the Nagorno-Karabakh Republic. Nagorno-Karabakh is the modern designation for a southern part of the Lesser Caucasus range, encompassing the highland part of the wider geographical region Karabakh. The name Karabakh itself (literary meaning "Black Vineyard") was first employed in Georgian and Persian sources from the 13th and 14th centuries to refer to an Armenian principality known by modern historians as the Kingdom of Artsakh or Khachen. The Nagorno-Karabakh War, referred to as the Artsakh Liberation War by Armenians, was an ethnic and territorial conflict that took place in the late 1980s to May 1994, in the enclave of Nagorno-Karabakh in southwestern Azerbaijan, between the majority ethnic Armenians of Nagorno-Karabakh backed by the Republic of Armenia, and the Republic of Azerbaijan. As the war progressed, Armenia and Azerbaijan, both former Soviet Republics, entangled themselves in a protracted, undeclared war in the mountainous heights of Karabakh as Azerbaijan attempted to curb the secessionist movement in Nagorno-Karabakh. The enclave's parliament had voted in favor of uniting itself with Armenia and a referendum, boycotted by the Azerbaijani population of Nagorno-Karabakh, was held, whereby most of the voters voted in favor of independence. The demand to unify with Armenia, which began anew in 1988, began in a relatively peaceful manner; however, in the following months, as the Soviet Union's disintegration neared, it gradually grew into an increasingly violent conflict between Armenians and Azerbaijanis, resulting in claims of ethnic cleansing by both sides. Full-scale fighting erupted in the late winter of 1992. International mediation by several groups failed to bring an end resolution that both sides could work with. As many as 230,000 Armenians from Azerbaijan and 800,000 Azerbaijanis from Armenia and Karabakh have been displaced as a result of the conflict. 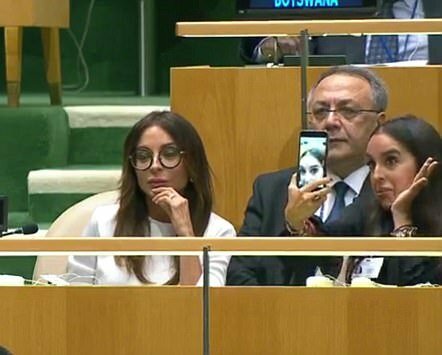 While you may feel wars are bad, the daughter of Azerbaijan's president has been slated online after she took ridiculous seflies while her father spoke to the UN about genocide. Leyla is at first seen listening intently to her father's speech as she sits beside her 53-year-old mother Mehriban in the hall. Then - not even two minutes into her father's delivery - she starts turning her smartphone on herself. According to Azerbaijani news agency APA, the president was making a deadly serious - and controversial - speech about a 1992 war with Armenia. He said: 'As a result of Armenian aggression, more than one million of Azerbaijanis became refugees and internally displaced persons.' He also spoke of a particularly bloody moment in the war commonly known as the 'Khodjaly massacre', which many people in Azerbaijan deem a genocidal act - though Armenia has strongly contested the claim. The president said: 'Armenia committed genocide against Azerbaijanis in Khodjaly.